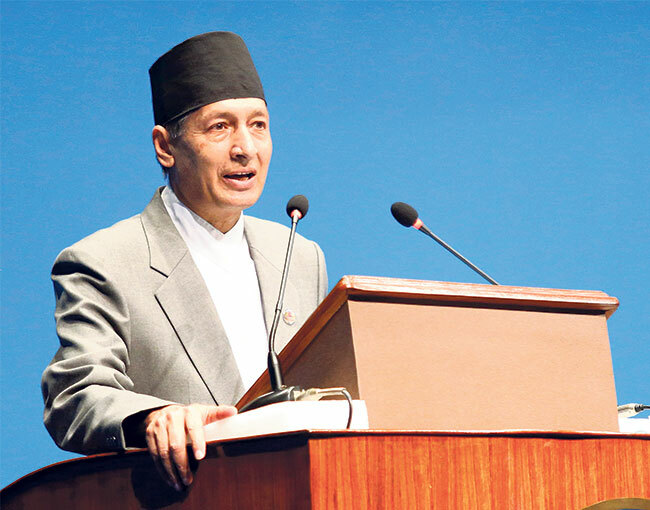 KATHMANDU, May 30: Finance Minister Yuba Raj Khatiwada tabled a budget of Rs 1.31 trillion in parliament Tuesday. This first full-fledged federal budget has emphasized job creation, allotted a third of the total budget for the provinces and local units. But its two targets – 33.69 percent revenue growth and 8 percent economic growth—are highly ambitious. The other important moves it has taken are to become self-reliant in about a dozen products by boosting the production of cement, sugar and iron rod, and some others approaches. The budget has broken with past budgets in several ways. Despite tall promises of several ambitious and fancy programs in the left alliance’s election manifesto, the budget has tried to be much more realistic and has dropped those programs. This means it has not kept the promises with which the ruling parties went into government after winning nearly two-thirds majority votes. 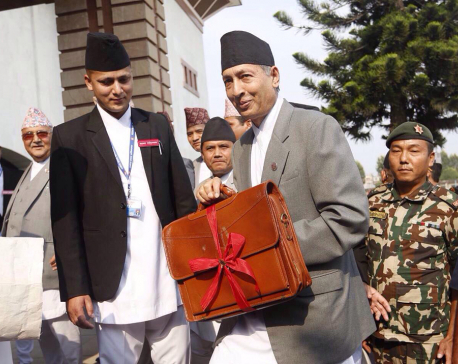 Minister Khatiwada started out reading the budget with the focus on job creation, boosting production and progressive taxation. The budget figures which were increasing in a range of 15 to 21 percent in recent years have been held down at almost the same level or there have been no changes at all. The government’s income and expenditure figure was Rs 1.28 trillion last year. However, this budget has a target of 33.69 percent revenue growth, which is ambitious. 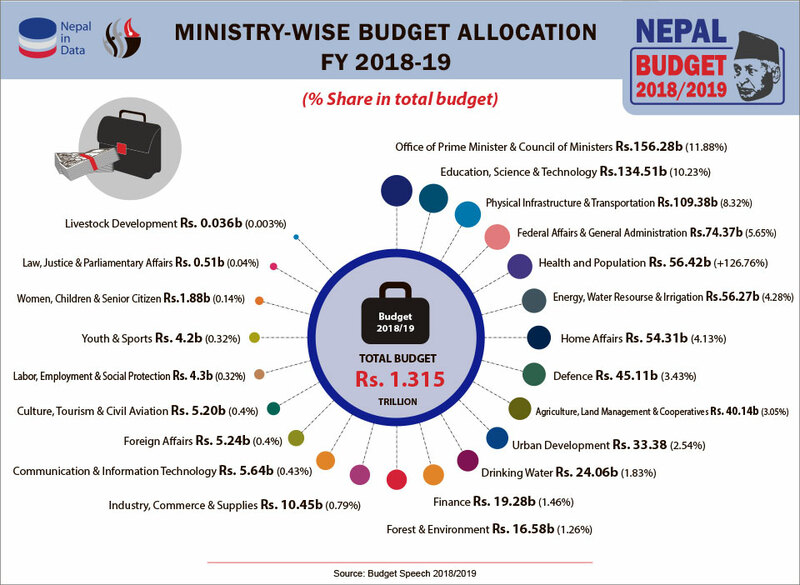 Unlike in the past budgets, the finance minister has spelled out very few projects in his budget speech including some important projects like the Madan Bhandari Highway, an east-west highway through the Chure range. It has not mentioned any infrastructure projects as expected. Economists have a mixed response to the budget. They have termed it a good federal budget and more realistic as it has tried to focus on job creation, a concern of all. 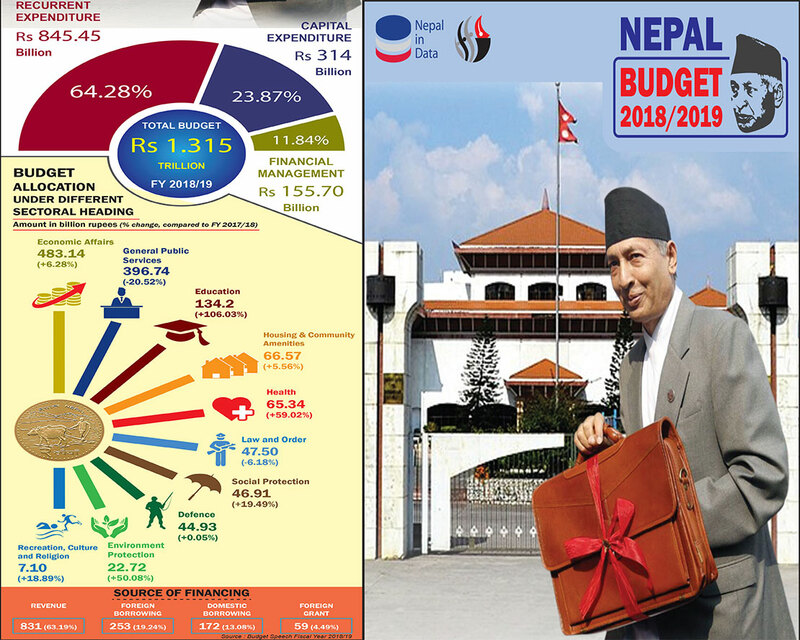 Economist Bishwa Paudel said the budget is realistic in a way but has failed to come up with concrete programs for bringing in 2 million tourists within two years or programs to increase agricultural production and productivity. FNCCI President Bhawani Rana pointed out the emphasis on reducing imports and the programs for entrepreneurship development and skill-oriented training. The government had unprecedented opportunity for allocating budget for development and prosperity and people had expected accordingly. But the budget has failed to deliver on the promises made by the ruling parties. It is just a continuity of the past programs. The government has announced up to Rs 1 million in business loan to foreign employment returnees willing to use their work skills and knowledge within the country. The returnees would be eligible to such loan upon submission of a business proposal with credential of their skills, experience and knowledge in the concerned fields. The business loan for returnee migrants is one of many schemes aimed at promoting entrepreneurship inside the country in the fiscal budget 2018/19 unveiled on Tuesday. The government has allocated Rs 3.10 billion budget for the labor sector. The business loan for the returnee migrants was the highlights of schemes introduced to promote small business and reintegrate the returnee migrants in society. Though this budget has improved some aspects of the scheme including the loan amount, the business loan for the returnee migrants and degree holders are continuation of a similar scheme introduced in the past. The business loan to students in fact had failed to attract students due to red tape and banks’ unwillingness to comply with the government provision. Though the loan for returnee migrants have been described as a much needed measure for reintegration of migrants and for slowing down the vicious cycle of migration, experts say that it will only benefit the skilled workers who constitute around five percent of around 2.5 million migrant population. Around 500,000 migrants leave the country for overseas job each year. The fiscal budget 2018/19 unveiled on Tuesday among other things has announced to revise the minimum wage, impart job-oriented training for jobless youths for promotion of local business and creation of new jobs. Even as the promotion of the local business was the focus of the budget, the government has also announced to give continuity to various past programs and policies targeted at the migrant population. The government has announced to expand overseas employment-related service to each federal province and give continuity to pre-departure training for the outbound migrants.